It's Earth. But this Earth is locked in eternal war between Heaven and Hell. There are armies of angels fighting hordes of demons, and the few humans that remain are caught in between. Apocalypse World is a version of Earth in an alternate universe, one in which the forces of Heaven and Hell are fighting with humanity caught in the middle. It is connected to the world of the Winchesters by rifts. The point of divergence for the two universes occurred on May 2, 1973. In this world, when offered a deal by the Prince of Hell Azazel to resurrect John Winchester, Mary Campbell refused. As a result, Sam and Dean never existed and thus did not stop the Apocalypse from happening as they did in their world. A portal was opened by the birth of the Nephilim Jack. An alternative method to open a rift was discovered by the Apocalypse World version of Kevin Tran, who was able to devise a spell (of which the key ingredient is the grace of an archangel) by studying the angel tablet of that universe, however the spell is designed to admit one traveler at a time. Later, Donatello Redfield was able to locate a different spell in the demon tablet for opening portals, but due to his soullessness, the dark energy within the tablet corrupted him. Castiel was able to strip the spell from Donatello's mind, leaving him brain-dead. The spell requires four major ingredients: The grace of an archangel, a fruit from the Tree of Life, the Seal of Solomon, and the blood of "a most holy man." Something that has been to the world is required to open the desired rift, which will remain open for 24 hours unless the spell is continuously replenished with archangel grace to extend the rift's lifespan. Map of the United States in Apocalypse World. In this world the Apocalypse happened, and the battle between Michael and Lucifer has left Earth a barren wasteland littered with the bodies of angels, demons, and humans. Death has been locked away and Michael has enslaved the reapers. Also it appears that while there may be multiple universes there is only one God who created them all. 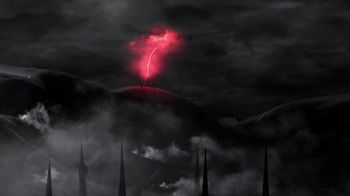 Large angel blade-like spikes can be seen protruding from the ground with bodies impaled on them, while the skies crackle with red lightning. 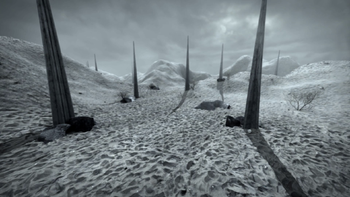 Time appears to move differently, as when Castiel first steps through to the rift during the day, he finds himself on the apocalyptic landscape at night. At some point during the various wars that have gone on, the number of humans appears to have dwindled significantly. Once Michael began his extermination of the humans, there was no thought of what would happen to the monsters with a dwindling food source. When starvation set in for the monsters they reverted to a more feral state, operating solely on pure, stupid appetite, while also seemingly going through various physical changes. Under Michael's rule, the United States is divided into districts and restricted zones: The East Coast is split into "Northeastern" and "Southern Sectors," with Canada designated the "Northern Ice Fields." The Midwest from the Dakotas are designated the "Great Barren Plains," within which Michael's Fortress appears to be located somewhere in the vicinity of Kansas or Nebraska. Montana and Idaho are simply known as "The Void", and Utah, Nevada, Arizona, Colorado, and New Mexico make up the "Western District." The West Coast is simply marked as "The Rebels of California." Texas appears to have kept its name. The states of Pennsylvania, New York, New Jersey, Delaware, and Maryland have been marked as "Zone R4" and the rest of the states on the Northeastern tip of the United States are not present on the map. There is a wall running along the U.S. / Mexico border, where Mexico is simply designated as "South of the Wall." There also appears to be another wall along the U.S. / Canada border extending from the "The Rebels of California" to "The Void." There also appears to be impact/ground zero markings over Detroit and Los Angeles, which are later revealed to be the impact sites of EMP-like blasts that fried all the technology in North America. Some demons have a physical form on the earthly plane and no longer require vessels, as evidenced when Castiel is attacked by a horned tempter demon. Angels are fierce and brutal, militaristic warriors, as Bobby Singer told Sam and Dean that the only reason he didn't kill Castiel on sight was because "he wasn't wearing a necklace made out of baby ears." After becoming trapped in this world, Mary Winchester and the Nephilim Jack Kline form a resistance to protect the remaining human population against Michael and the angels. From a conversation with Bobby Singer, Mary determines that the divergence point between her world and this one was a simple choice in 1973: Mary's Apocalypse World counterpart refused the deal with Azazel to resurrect her deceased lover John Winchester. As a result, Sam and Dean never existed in this world to stop the Apocalypse, which went as planned in 2010. In 2018, Sam and Dean led an exodus of dozens of humans from Apocalypse World through a portal to their own universe. Amongst those that made it were Bobby Singer, Charlie Bradbury and Maggie. However, the effort cost the life of Gabriel while Lucifer was left purposefully stranded by Sam. Lucifer made a deal with Michael to work together to reopen the portal and reach the Winchesters' universe themselves. Apparently abandoning his armies in Apocalypse World, Michael reached the Winchesters' universe with Lucifer. The subsequent conflict with a super-charged Lucifer allowed Michael to gain his true vessel, Dean Winchester and he was set loose upon the Winchesters' world in Dean's body. Months later, Michael was finally killed by Jack using the power of his soul after Jack had lost his grace to Lucifer. Bobby Singer - Still a hunter in the post-Apocalyptic wasteland. This Bobby Singer has a self-described "passion" for hunting angels, for which he uses bullets forged from discarded angel blades, with his trusty machine gun, "Rufus." He also appears to be the leader of an encampment in Dayton, Ohio, consisting of a faction of the remaining humans. In Apocalypse World, Bobby had a son named Daniel while in the Winchesters' world he had no children. Bobby lost Daniel during the Apocalypse and is still haunted by his death. Bobby is currently working as a hunter in the Winchesters' world where Mary Winchester has developed a romantic interest in him that he appears to be too closed off to fully reciprocate. Mary Campbell - Killed ten years prior to the present by Azazel. She was a hunter that ran with Bobby Singer, was known to tell the same story about the man she loved, John Winchester, with enough pints of moonshine in her. She was indirectly responsible for creating the world by refusing to make the deal with Azazel to resurrect John, resulting in the Winchesters never existing to stop the Apocalypse. She is described as looking like her counterpart, only a year or two younger. John Winchester - Has been dead for over 40 years, due to Mary refusing to make the deal with Azazel in May 1973 to resurrect John, causing Sam and Dean to never be born. Azazel - After Azazel killed John, Mary refused to make the deal to bring him back. Bobby would go on to tell Sam and Dean that Azazel killed Mary ten years prior. It is unknown if he survived the Apocalypse that followed Lucifer's rise. Michael - Defeated his world's Lucifer, claiming to have ripped him apart over Abilene, Kansas. Michael has become a conqueror, bringing death and destruction to the planet rather than paradise. He is currently creating an army of monsters in Sam and Dean's world to destroy it as he did his own. He is killed and his grace absorbed by Jack Kline after Michael takes Rowena as his vessel. Lucifer - Counterpart of the main universe's Lucifer. Due to Sam and Dean Winchester not existing when he rose, the Apocalypse occurred and Lucifer was not locked away again. According to Michael, he tore this Lucifer to pieces in the skies over Abilene, Kansas. Kevin Tran - A prophet of the Lord like his counterpart. However, with no God to serve, Kevin believed that he must serve the ranking deity of the world, Michael. Much like his deceased counterpart, Kevin spent his days translating the various tablets to help in Michael's war machine. In 2018, Kevin used himself as a suicide bomber in an attempt to "break" Jack Kline, under Michael's orders, in order to be granted entry into Heaven to be with his mother once again. Linda Tran - Mother of Kevin Tran who was killed when the Apocalypse began. A major part of Kevin's motivation for helping Michael is that Michael promises him that he will ensure that Kevin is reunited with Linda in Heaven. Zachariah - A subordinate of Michael. Like his counterpart, Zachariah preferred to use mental manipulations to achieve his ends. He is killed by Jack Kline when he attempts to kill Mary Winchester. Charlie Bradbury - A fighter in the war against the angels, this Charlie is a member of the human resistance's inner circle. She shares many personality traits with the main universe's Charlie Bradbury. Balthazar - Like all angels, this Balthazar served under Michael. In 2018, he lead his army in an attack on Jack and Bobby, but was unprepared for the resistance and was killed by Jack Kline. Castiel - With Sam and Dean having never been born, this version of Castiel never rebelled against the angels or stopped the Apocalypse, instead turning against humanity along with the rest of angelkind. He became a master torturer/interrogator for Michael's army. In 2018, he was confronted by his counterpart, who killed him while Jack and the rest of the Winchesters saved Ketch and Apocalypse World's Charlie. Michael would later complain that this Castiel would never be as "anemic" as the Winchesters' Castiel. Jakob - A soldier in the human resistance, Jakob led a small group who were keeping their eyes on Michael's Fortress. He was killed when Kevin Tran used himself as a suicide bomb. Floyd - Floyd was making his way to Dayton alongside a group of humans to join the resistance. When attempting to pass through the Morehead Tunnel, the entire group was killed by a group of rabid vampires except for Floyd and Maggie. After meeting Sam, Dean, Castiel, and Gabriel, they all traveled through the Morehead Tunnel, but Floyd was killed when the group tries to fend off the vampires. Maggie - A survivor of a rabid vampire attack, Maggie traveled with Floyd, the Winchesters, Castiel, and Gabriel to make their way to Dayton. She is one of the many humans from Apocalypse World who make their way to the Winchesters' world. She was killed by Lucifer, but Jack gets him to revive her in exchange for exploring the universe together. She later becomes a hunter in the Winchesters' world. After Michael takes Rowena as a vessel, he smites Maggie. Ryan - A refugee from Apocalypse World and a close friend of Maggie's. Karen Singer - The wife of Bobby Singer and the counterpart to Karen Singer. Like the Karen who was the wife of the Bobby that the Winchesters knew, she also died under unnatural circumstances, driving her husband to hunting. Unlike her counterpart, she and Bobby had a son named Daniel who was also driven by her death to become a hunter. Daniel Singer - Bobby Singer's son in Apocalypse World who has no counterpart in the Winchesters' world. After the death of his mother, Daniel became a hunter alongside his father until the onset of the Apocalypse. Daniel fought in his father's platoon during the war, but was abducted and killed by the angels. His body was never found and his death continues to haunt his father. Jules - One of the many refugees who arrived from Apocalypse World. She and Castiel attempted to help Lora, who was suffering from an aging spell, but Jack ultimately discovered how the spell worked and neutralized it. Smithy - Among the Apocalypse World refugees, he appears to be their chef, making food for the other hunters. He was killed by one of Michael's rugarus during a monstrous incursion into the Bunker. After Jack inadvertently causes a rift in space and time, Castiel crosses over to investigate. Once through he finds himself on a dark and barren landscape, and is soon attacked by a tempter demon, which is shot and killed by that universe's Bobby Singer. Bodies of demons, angels and humans strewn over the land. When Sam and Dean learn about the rift they too, cross over with Castiel, where they meet with Bobby. Castiel and Bobby explain what happened in that universe -- Sam and Dean were never born on that world and thus never saved it from the Apocalypse. Soon after leaving, Sam, Dean, Castiel, and Crowley formulate a plan to trap Lucifer on the other side. When Lucifer finally locates Kelly Kline's location, Sam and Dean lure him into the Apocalypse World, where Crowley has set up the ingredients for a ritual to close the rift, telling Sam he is missing only the final element: a sacrifice. As Dean attempts to keep Lucifer distracted by riddling him with angel blade bullets from Bobby's machine gun, Crowley intervenes before Lucifer can kill Dean. Lucifer tells Crowley that no matter what he tries, he will lose. Crowley turns to Sam and Dean and bids them a final "Bye, boys" before stabbing himself with an angel blade and completing the ritual. As the rift begins shrinking, Castiel comes marching through it, and with an angel blade in hand drives it into Lucifer as Sam and Dean make their escape. Castiel soon follows, but is almost immediately killed by Lucifer after stepping through. Lucifer then turns his attention to Sam and Dean. However, Mary arrives and begins beating him back with Enochian brass knuckles, until he falls backward into the rift, dragging Mary along with him. On the other side, Lucifer looks on in anger as the rift closes, trapping him along with Mary. Soon after being stranded, Mary attempts to flee from Lucifer, but doesn't make it far before he captures her. She asks if he is going to kill her, but Lucifer tells her he needs her. Lucifer and Michael size each other up. As Lucifer and Mary trek the desolate landscape, Mary stops telling Lucifer it doesn't matter because he will just kill her anyway. Lucifer, goes on to tell her that he needs her as a bargaining chip to get his son back from Sam and Dean. A fireball soon comes barreling towards them, crashing into the earth. In the chaos of the impact, Mary is able to slip away from Lucifer. On the run, she comes across a hunter, who realizes she isn't an angel and tests if she is a demon. When he begins invading Mary's space, she fights back and in the ensuing scuffle, the hunter is impaled by Lucifer punching a hole through his chest. As they continue on their journey, they are soon met by a flight militaristic of angels, who "sense a creation that sinks of Hell" and demands Lucifer identify himself. When the commanding angel doesn't believe him, telling him Lucifer was killed by the archangel Michael. The angels prepare to smite Lucifer on their leader's command, as their eyes glow blue, Lucifer simply snaps his fingers and disintegrates the lot. This act garners the attention of Michael, who crashes to the earth like a comet, emerging from the crater wings spread open. Realizing the angel before him is indeed Lucifer, he questions him how he is alive, Lucifer casually mentions alternate universes. Lucifer mocks Michael telling him he is a cheap knockoff of his brother, Michael then tells Lucifer of how he ripped his brother apart over Abilene, Texas. Realizing a fight is going to happen, Lucifer sucker punches Michael, but is quickly subdued and captured by Michael. Inside a dilapidated church, Michael tortures Lucifer. Tapping into Lucifer's temporal lobe, Michael causes him to ruminate on the nature of God, the universe, and humans, allowing Michael to gain a peek at the other Universe. Michael brings Kevin Tran to the church, who reveals that he has devised a way to open a new rift using the grace of an archangel. Refusing to give any of his, Michael takes most of Lucifer's grace. Kevin performs the spell, which causes a new tear in space and time. However, Lucifer is able to break free and jump through it, causing the rift to close behind him and leaving Michael to devise a new method of creating a portal. Jack travels through the post-Apocalyptic landscape. While meeting with dreamwalker and artist Derek Swan, Jack tells him he wishes for Derek to take him to Apocalypse World, pointing to a recently painted picture which depicts the post-Apocalyptic landscape. 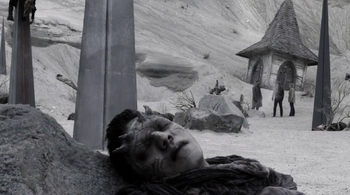 Performing the ritual for Jack, Derek is able to find the world but is not strong enough to sustain a connection until Jack uses his powers to see what Derek sees. Through Derek's dreamwalking, Jack is taken through the landscape to Michael's Fortress where he sees Mary, still alive, suspended in a hanging cage being tortured. Under siege from angels, Kaia Nieves and Jack attempt to reach Apocalypse World and open a portal using her dreamwalking abilities. Kaia is initially only able to access the Bad Place, but with Jack's help is able to pull back into the Multiverse, where he is able to locate Apocalypse World. As Jack locates Mary again, Kaia begins losing her connection to Apocalypse World and begins popping in and out of the Bad Place. The combined powers of Jack and Kaia become too much and a surge of energy explodes from them, killing the angels while transporting Sam and Dean to the Bad Place and Jack to Apocalypse World, where he regains consciousness at Mary's feet. After being rescued by Claire Novak and Kaia Nieves in the Bad Place, Sam questions where Jack Kline is. Kaia tells him that she thinks that Jack is in Apocalypse World with their mother. The Apocalypse World version of Zachariah is seen attempting to manipulate Jack's mind, which is ineffective as Jack is able to see through the illusion. Angry at his failure, Michael throws Jack in the same prison cell as Mary intending to torture them later. After finding a weak spot in their prison cell's warding, Jack and Mary make their escape and find themselves taking refuge with Bobby Singer. He takes the two to his camp located in a wooded area. When they are shocked by all the injured people, Bobby explains that the angels have done worse, revealing that two days prior a colony in San Antonio of 400 people were slaughtered by angels. Later, Mary and Bobby have a conversation about the Mary Campbell of Apocalypse World, where Bobby reveals to Mary how refusing to make the demon deal to save John's life resulted in regret and the world becoming what it is. When Bobby notices the shadow puppets Jack is making for the children of the camp, he asks Mary if Jack is a psychic or a witch. When he learns Jack is a Nephilim he tells Mary about how the angels betrayed the human race during the Apocalypse and he wants him out of the camp by morning. Mary in turn tells him she will leave with him, which Bobby does not argue with. When morning comes, Mary approaches Jack to tell them they will have to leave the camp, but they are startled by the sounds of a warning siren and angels dive-bombing into the camp. As Mary and Jack escape into the woods they find Bobby who tells them the angels have located them due to Jack using his powers. Wanting to help, Mary is tasked with getting the children to the camp's escape tunnels, but Bobby tells Jack he's done enough. Mary tells him to hide from the angels as she goes off to help the children. While helping a young girl, Mary is beset by Zachariah, who prepares to kill her as Jack arrives, but is quickly stopped when Jack uses his powers to freeze Zachariah and disintegrate him. When more angels begin dive-bombing towards the camp, Jack once again focuses his power and causes them to explode in the skies. As Bobby thanks Jack for saving them, Jack tells him and Mary that he has realized that as long as Michael is around the war with the angels, demons, and humans will continue indefinitely, and declares his intent to kill Michael. Upon exiting the rift, Dean and Ketch find themselves in a snowy landscape. 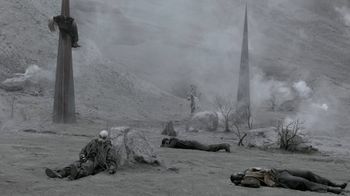 Initially confused about their whereabouts, Ketch questions Dean, who admits that the location is different from his last time in Apocalypse World. When he tells Ketch to go "save himself somewhere else", Ketch offers to help find Jack and Mary with Dean. Dean accepts and the two begin their journey. Ketch and Dean come across angels executing humans on a bridge; when the final human's hood is removed, Dean sees it is that universe's Charlie Bradbury. He is able to overhear that she has been in contact with Mary and Jack, before she is teleported away to a POW camp for interrogation. Realizing Charlie is his best chance for finding Mary and Jack, Dean decides to attempt to save her, despite Ketch's objections. Humans being rounded up by the angels at the Northern POW Camp. As they make their way through the snowy wilderness, Dean is shot and attacked by a human bounty hunter collecting humans for the angels. The fight is broken up by Ketch, who questions where he was taking Dean. When the bounty hunter refuses to answer, Dean shoots him in the leg and coerces the location of the Northern Camp where Charlie was taken, before knocking the man out. As they continue to walk, Dean is visibly weakened. eventually collapsing from his bullet wound. Ketch realizes the bullet was coated with a poison similar to one the British Men of Letters use, and he mends it with an antidote. As night falls, Dean refuses to take a break until he collapses, conceding to break for five minutes. Dean finally reveals to Ketch that his guilt over Charlie's death is also driving him to rescue her. Ketch tells him he understands the drive to make amends for past mistakes, and agrees to Dean's plan. At the POW camp, Charlie is being interrogated by angels, but is uncooperative. The commanding angel eventually decides to execute her, and she is tied to a post outside. As the executioner prepares to swing his blade, but before he delivers the killing blow, Dean tosses a grenade into the camp, causing a chaotic distraction. This allows him and Ketch to rush the gates, killing any angels in their way, and rescue Charlie. During their escape, Dean explains the situation to Charlie, revealing he was friends with her double, and how he is looking for Jack and Mary. Charlie tells him that the last she heard the two were in what remains of Dayton, Ohio. As the trio finally reach the rift, Ketch tells Dean he will be staying behind, and to bring back as much help as possible. Charlie says she is also staying behind, saying that it's her fight and her friends need her. Jack is relating to Mary his recent victory over the angel Balthazar when they come across a fellow fighter, Jakob, who reveals to them that Michael and his forces have abandoned his fortress. Using astral projection, Jack scouts the wastelands and confirms that the fortress is empty but for a few sentries. They move to investigate. Jack and Mary's group soon arrive at the old church, where Jakob finds Kevin Tran locked in the dungeon. Kevin pleads his innocence, telling the group he was forced into helping Michael, who promised to save humanity. 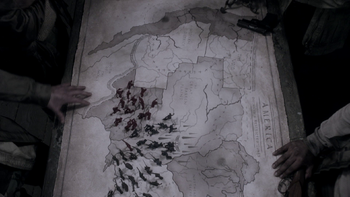 After they find a map, with toy soldiers representing forces gathered to the south, Kevin reveals that Michael has found a place where the wall between worlds is thin and plans to cross over. He warns that Michael doesn't make mistakes and that he left the map for a purpose. As Jack and Mary argue about whether the time is right for attacking Michael, Mary tries to talk Jack into waiting until Bobby arrives in a day. Jack is briefly swayed, but then changes his mind. As he prepares to leave, Kevin reveals his betrayal, explaining that Michael left him behind to give Jack a message by breaking him through killing everyone around him. Activating an explosive sigil carved into his chest, Kevin is engulfed in a blinding light as Jack uses his wings to protect himself and Mary. Jakob and the other men are caught in the blast and killed. In the aftermath, Mary tries to comfort Jack, who wonders what the point is, if he can't protect everyone. Arriving in Apocalypse World, Sam, Dean, Castiel, and Gabriel find themselves in Northern Kentucky, roughly two days away from their destination of Dayton, Ohio. As the group begins their two-day trek, they hear screams nearby. They rush over, much to Gabriel's protests, to find a feral vampire attacking two humans, Floyd and Maggie. Dean kills the vamp, and the two reveal to the group that when the angels began their extermination, they didn't consider what would happen to the monsters. With a smaller food supply, monsters like vampires devolved into a more feral state. Maggie tells them they were also en route to Dayton, having heard about Jack and Mary's satellite colony, but when attempting to cross through the Morehead tunnel, their group of nine came across a vampire nest, leaving only Floyd and Maggie as the survivors. With the Morehead tunnel the quickest route through to Dayton, Sam offers Maggie and Floyd protection through the tunnel. The group enters the Morehead tunnel. Upon entering the tunnel, they quickly come across a vampire feeding off of the body of one of Floyd and Maggie's group, and it is swiftly decapitated by Sam. As they continue on, they find that their exit is blocked and have Castiel and Gabriel clear the path. As Gabriel and Castiel begin moving the rubble, the group is attacked by vampires. Sam and Dean do their best to fight them off, but Floyd is dragged away down a dark tunnel. As Dean saves Maggie from a vampire Sam has his throat ripped out and dragged away. When Dean attempts to go after him, he is stopped by Castiel, who reminds him that there is nothing they can do, and they make their escape. 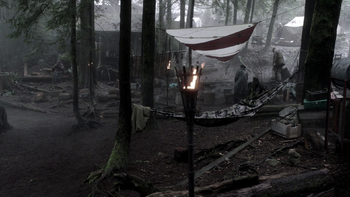 Finally arriving in Dayton, Gabriel shuts down the camp's warding sigils, allowing Castiel entry. The group is set upon by human resistance fighters and reunited with Mary and Jack, who learn of Sam's death. Back in the tunnels, Sam's dead body suddenly comes back to life thanks to Lucifer, who reveals to Sam he has consumed the grace of Michael's angels allowing him to bring Sam back and hold the nest of vampires at bay. He tells Sam he will strike a deal with him: in exchange for getting out of the tunnel, he wants to meet his son, Jack. Otherwise he will let the vampires attack Sam. 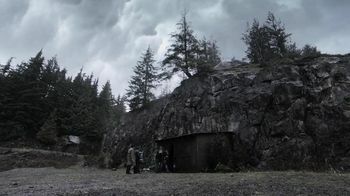 At the base camp, Dean prepares to leave to retrieve Sam's body as Jack admonishes Castiel and Gabriel for letting Sam die. Just as Dean is about to leave, he is shocked by the sudden arrival of a bloody but alive Sam, followed by Lucifer entering the camp. With the arrival of Sam and Lucifer to the camp, tensions quickly boil, causing Jack to teleport away from the fighting. As Gabriel goes to look for Jack, Castiel restrains Lucifer with the angel cuffs, as he reveals that the rift will remain open for at least 31 hours. Sam and Dean reunite and go talk to Mary about finally leaving Apocalypse World, only for Mary to regretfully refuse their offer, telling her boys that she has been fighting with the refugees for nearly a year and can't abandon them. Sam, however, thinks of a compromise -- they take everyone back to their universe. On the road to Bobby's salvage yard, the camp runs into a group of angels, but before they can smite anyone, Lucifer snaps his fingers and disintegrates them all, revealing to the group he only allowed them to restrain him for their own benefit as the handcuffs melt off his wrists. At Bobby's salvage yard, the Winchesters put forth their plan to the leadership of the resistance who agree to put it to a vote. However, they then get news that Charlie Bradbury and Ketch have been captured by angels after falling into a trap. The angels torture the two for information on the resistance, but they refuse to break so the angels call in an expert torturer - the alternate Castiel. Before the torture can begin, Sam, Dean, Mary, Jack, and Castiel attack, rescuing the two and killing their captors. The alternate Castiel attempts to escape but is caught and killed by the Winchesters' Castiel after a confrontation. 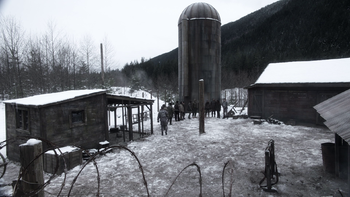 After returning to Bobby's salvage yard, the Winchesters learn that the resistance has voted unanimously to evacuate through the portal to the Winchesters' world. Dean and Lucifer repair a bus to carry everyone and the evacuation begins with less than two hours to go. The Winchesters lead everyone to the portal just as it's on the verge of closing, but Rowena is able to hold it open using power from the Black Grimoire. The resistance travels through the portal with almost everyone making it through, including Jack and Mary, before Michael arrives to stop them, killing three resistance fighters with his arrival. Lucifer and Gabriel's attempts to stop Michael fail, resulting in the death of Gabriel. Before leaving, Sam purposefully strands the injured and weakened Lucifer in Apocalypse World again. Michael tries to follow Sam through the portal, but it closes before he can reach it. Later, near the former location of the portal between the worlds, Lucifer offers Michael a deal to share with him the spell to reopen the portal. The two make a deal to leave Apocalypse World together with Lucifer getting his son and Michael getting everything else. In the Men of Letters Bunker, Sam informs the Apocalypse World refugees of the differences between their two worlds. Later, the Winchesters are shocked when they come under attack by Michael, having believed him to be trapped in Apocalypse World. Charlie explained how some of the Apocalypse happened in her world to Sam. When Michael and Lucifer began fighting, a giant electromagnetic pulse went off over North America and fried all the technology. When their food sources dried out, the people became violent and started attacking others to steal whatever they can. Lots of people died in the process, including Charlie's girlfriend Kara. This experience left Charlie faithless in humanity and society, believing that it will all fall apart one day. Michael tells Violet that he kept Death imprisoned in his cage while his angel armies enslaved the reapers. Mary's funeral is attended by a group of Apocalypse World refugees, including Jules. Dialogue in 13.20 Unfinished Business suggests that the Apocalypse began in roughly 2010 in this world. In 14.02 Gods and Monsters, Bobby Singer comments that he has been fighting it for fifteen years, meaning since around 2003. However, this comment may also refer to Bobby trying to stop the events leading up to the Apocalypse.